The world is ever changing and with it is the role of women in every field of life. Women are there everyday, somehow or the other contributing to someone’s achievements, celebrations and life in all its glory. To celebrate the strength of women and their progress and to promote their rights, International Women’s Day (IWD) was celebrated in the month of March globally. 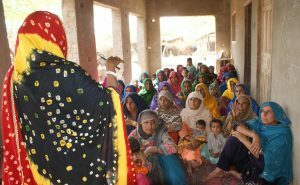 Buxo Lund, a small village in the rural district of Badin in the southern province of Sindh in Pakistan, celebrated the day with as much vigor and zest as all over the world. This day gave the people of Buxo Lund an opportunity to recognize the role of their women who work effortlessly all year for their families and their communities. Women in Buxo Lund are usually occupied with household errands, stitching clothes or handicrafts for their family members or helping on the agricultural fields. They were never aware of International Women’s Day or its global commemoration. shared Goveri, a resident of the village. 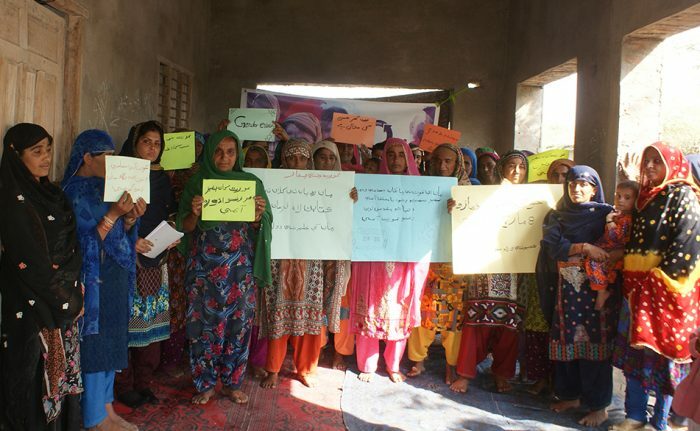 Under the Promoting Sustainable Agriculture Practices to Improve Food Security and Livelihoods of Vulnerable and Marginalized Farmers of Badin Project, the program team, in coordination of the local Farmer Field’s Group (FFS) established under the same project, organized community based activities to celebrate Women’s Day. Thirty-five women participated in the event. Amina, resident of Buxo Lund, officially opened the event with the recitation of the Holy Quran. 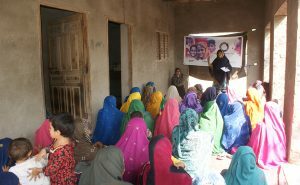 Shazia Shah, a Nutrition Officer with Community World Service Asia, delivered a brief introduction of the organization and its project with the community in Badin. Apart from promoting sustainable agriculture here, we highly support and encourage the participation of rural women farmers to ensure achieving food security here and long-term development of the village. The on-going capacity building activities, including farmer festivals, exposure visits to agricultural institutes, awareness raising session and celebration of international day with the community’s participation has served as an engaging and empowering platform for women here. International Women’s Day is a day of recognition and celebration of women globally. This day values the contributions that women bring to communities. Farzana, Community Extension Worker highlighted the basic rights women are granted globally and emphasized on minimizing cultural and social barriers to strengthen gender parity in the society. Women play a significant and prominent role in every household. A family without the contributions of women is incomplete. She cares for her family as a wife, feeds the children as a mother and supports her siblings as a sister. Every human being deserves to live a happy life. Women should not be overlooked, but they should be respected as equally as men. This event has enhanced our knowledge in women’s rights. We now know that women deserve equal rights as men do in our village. The views and statements contributed in the event by the local women indicated towards the compassion, will and resilience of these women. positively added Bhoori, a mother and farmer living in Buxo Lund.